From 107 rivalry games between Washington and Washington State, a series that dates to 1900,15 players went on to become pro or college football hall of famers. Of the six, all but Bledsoe, who quarterbacked the Cougars to one of their most memorable Apple Cup victories (1992 in a Pullman snowfest), gained induction in either the Pro Football Hall of Fame (Canton, OH.) or College Football Foundation Hall of Fame (South Bend, IN). Ten other players who starred in the state rivalry game, with the 108th edition at 12:30 p.m. Friday at Husky Stadium, also made one of the two halls of Fame, starting with Washington’s George Wilson, who had a hand in three UW victories over WSU from 1923-25. 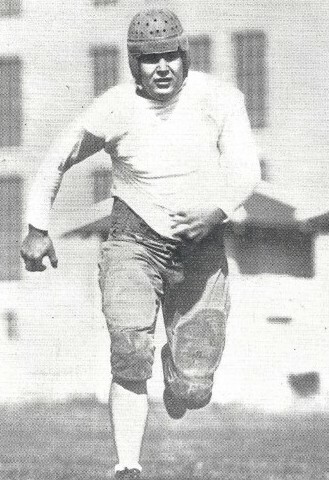 Wilson (1923-25) became the University of Washington’s first consensus All-America player in 1925 and led the Huskies to their first two Rose Bowl appearances (1924, 1926). During his career, with the two-way Wilson leading the way, the Huskies compiled records of 10-1 (1923), 8-1-1 (1924) and 11-1-1 (1925). Eighteen of those victories were shutouts. The Huskies outscored their opponents 1,102 to 107. Wilson scored a school-record (since eclipsed) 38 touchdowns during his career. He ran, passed, caught passes, punted and kicked extra points. In 1925, against Washington State, he returned an interception 90 yards for a touchdown, which stood as the school record until 1975 (Al Burleson, 93 vs. WSU). Following his UW career, Wilson played in a series of famous exhibition games against All-America star Red Grange of Illinois, played for three seasons in the National Football League, and finally became a professional wrestler. Inducted into the College Football Hall of Fame in 1951, the State of Washington Sports Hall of Fame in 1960 and the Rose Bowl Hall of Fame in 1991 . . . Named to Washington’s All-Time Team in 1950, to the All-Time Western All-Star team in 1969 and to the All-Time All-Northwest team in 1977. WSU head coach Babe Hollingbery recruited Melvin Jack Hein out of Burlington-Edison High School in Burlington, WA., in 1927. The 6-foot-2, 225-pound Hein initially expressed interest in becoming a rower, but gravitated to football and basketball when he discovered how good he was at those sports. Hein caught Hollingbery’s attention when he played center and defensive lineman for the Burlington Tigers. As a senior, Hein earned the Skagit County Football MVP award, the highest accolade for a prep player in the Skagit Valley in those days. He was also named first-team All-State as a senior. 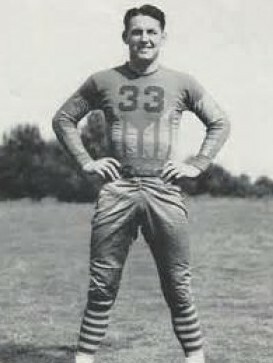 Hein played all three interior line positions at Washington State from 1928 through 1930 and captained the 1931 Rose Bowl team. During Hein’s tenure, WSU went 26-6, winning 15 of the 26 by shutout. Also a center on Jack Friel’s basketball team and winner of the javelin at the 1931 Drake Relays (199 feet, nine inches), Hein made Grantland Rice’s All-America team and first-team All-Coast after playing virtually every minute of every game. Initially snubbed by the pros, Hein wrote to three teams requesting a tryout and ultimately landed with the New York Giants for $150 per game. He became a 60-minute regular for the next 15 years and was widely considered the best player in the league for more than a decade. Inducted into the College Football Hall of Fame in 1954 and the Pro Football Hall of Fame in 1963 in the inaugural Canton class . . . First-team All-NFL center eight consecutive years (1933-40) . . . Second-team All-NFL five other times . . . NFL’s All-Decade Team of the 1930s, 75th Anniversary Team in 1999 . . . 1938 NFL MVP (last interior lineman to win) . . . In 1999, despite 55 years having passed since his final game, The Sporting News ranked Hein No. 74 on its list of the “100 Greatest Football Players of All-Time. 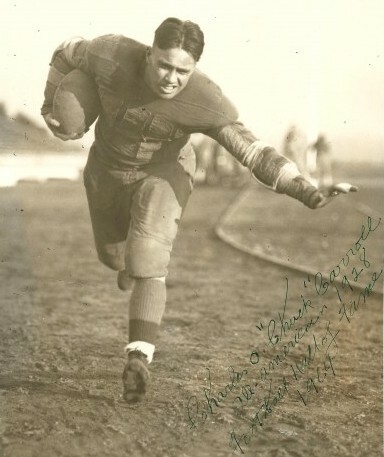 A University of Washington consensus All-America in 1928, Carroll scored 32 touchdowns during his UW career (1926-28), including 17 in his senior year that stood as a school record until Mario Bailey scored 18 in 1991. In 1928, Carroll scored 36 points against the College of Puget Sound, another school record. One of three players to have his number (2) retired, Carroll prepped at Garfield High School. 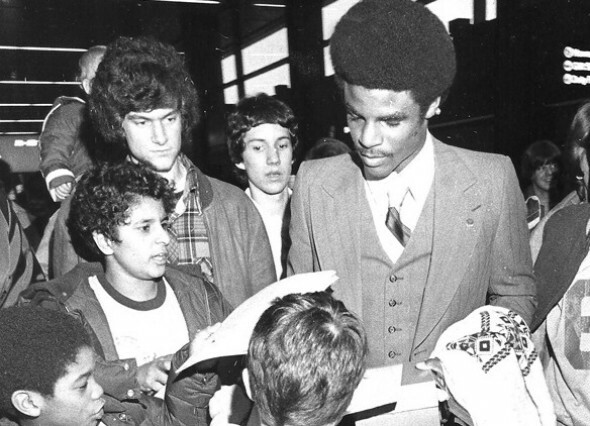 Following his athletic career, Carroll graduated from the University of Washington Law School and eventually served for 22 years as the King County Prosecuting Attorney. Inducted into the Helms Athletic Foundation Hall of Fame in 1958 and the College Football Hall of Fame in 1964, becoming the second Husky player enshrined (Wilson, 1951) . . . Named first-team All-America in 1928 by the Associated Press, United Press International, the Saturday Evening Post and Pop Warner, becoming Washington’s second consensus All-America, following Wilson in 1925 . . . Scored a school-record six touchdowns Nov. 3, 1938, in Washington’s 40-0 victory over College of Puget Sound (36 points remains the most in a game by a UW player) . . . Rushed for 136 yards and two touchdowns Oct. 22, 1927, in Washington’s 14-0 victory over Washington State . . . Named to Washington’s All-Time Team in 1950. 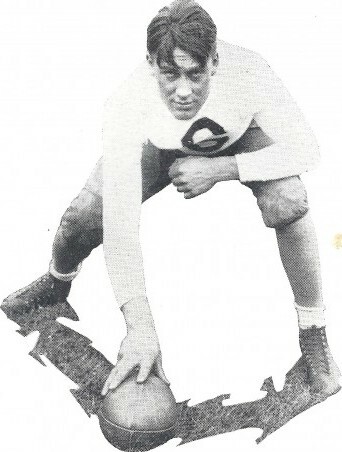 Schwegler (1929-31) played tackle on offense and defense and, in 1931, became the first two-time, first-team All-America in Washington football history. During Schwegler’s career, the Huskies posted a 12-13-1 record and recorded some of the biggest victories in school history, including a 73-0 triumph over College of Puget Sound in 1929, 60-0 over the Loggers in 1930, and 77-0 over Whitman in 1931. Schwegler, who graduated two years before the formation of the modern National Football League, opted to not play pro football, choosing a Hollywood film career instead. He had roles in a dozen movies, acting with Spencer Tracy and Shirley Temple. Inducted into the College Football Hall of Fame in 1967 and the Washington State Sports Hall of Fame in 1986 . . . Named to the All-Time Washington Football Team in 1950 and Washington’ All-Centennial Team in 1990 . . . First-team All-America by the Associated Press, United Press International and Pop Warner in both 1930 and 1931. Edwards came out of Clarkston (WA.) High School in 1928 and teamed with Mel Hein to lead Washington State to a 9-0 record and a berth in the 1931 Rose Bowl opposite Alabama. Along with Hein, the pair became the Cougars’ first-ever All-America selections. Washington State won 25 of 32 games with Edwards in the lineup. 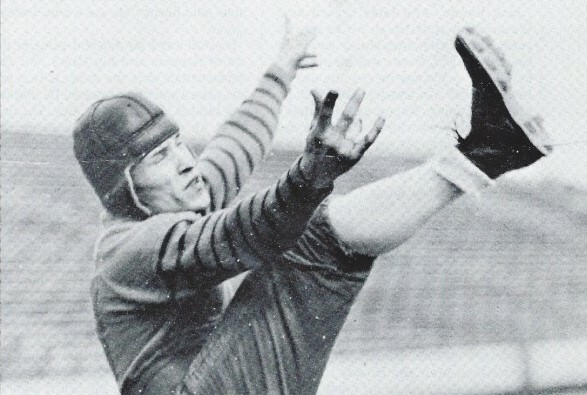 Edwards left WSU in 1931, five years before the first NFL draft, and received offers from three franchises, the Boston Braves, New York Giants, and Portsmouth Spartans. Edwards could have joined Hein in New York, but chose the highest bid –- $1,500 for 10 games from the Braves, a team that later became the Boston Redskins, which moved to Washington D.C. in 1937. The 6-foot-2, 258-pound tackle played for the franchise through 1940, served as an assistant coach from 1941-45 and as head coach from 1946-48. After spending 17 seasons with the Redskins, Edwards retired and returned to the Pacific Northwest. 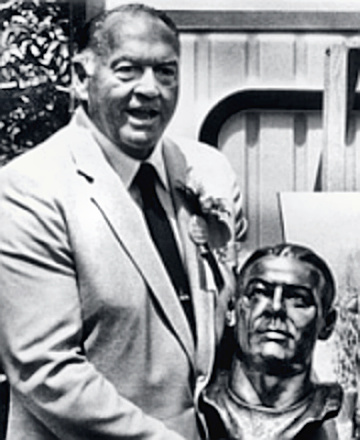 Inducted into the State of Washington Sports Hall of Fame in 1968, the Pro Football Hall of Fame in 1969 and the College Football Hall of Fame in 1975 . . . All-NFL honors every year of his career (first-team All-NFL in 1932, 1933, 1936, 1937) . . . Pro Bowler 1939 . . . Named to the NFL’s All-Decade Team of the 1930s. “The King” remains the most celebrated running back in UW history. His 233 points are the most by a non-kicker, and his 125 in 1951 stood as a school record for 45 years. His 296 yards and five TDs against Washington State in the 1950 Apple Cup have never been seriously threatened. Named to the Pro Bowl five times during his NFL career, McElhenny, a Los Angeles native, was a runner whose electrifying moves left spectators and opponents spellbound. The Barry Sanders of his day, McElhenny often zigged and zagged for 50 yards in order to gain five. And he was versatile. He caught passes and returned punts and kickoffs. Ultimately, McElhenny made every Hall of Fame available to him. Inducted into the State of Washington Sports Hall of Fame in 1963, the Pro Football Hall of Fame in 1970, the College Football Hall of Fame in 1981, and the East-West Shrine Hall of Fame in 2003 . . . All-Time All-Northwest team in 1977 . . . In three varsity seasons, established 16 UW and three conference rushing records . . . Only UW player with three different 90-yard scoring plays (100-yard punt return against USC in 1951, 94-yard kickoff return against Minnesota in 1949, 91-yard run against Kansas State in 1950) . . . NFL’s All-Decade Team of the 1950s . . . Six Pro Bowl games – 1952, 1953, 1956, 1957, 1958 and 1961 (MVP in 1958 ) . . . NFL Rookie of the Year in 1952 when he produced the season’s longest run from scrimmage (89 yards, TD), the longest punt return (94 yards, TD) and the top rushing average (7.0 yards per carry). Markov (1935-37) came to Seattle in 1934 from his native Chicago at the urging of UW alum Dr. Alfred Strauss and had an impact in three sports — football, wrestling and track and field. During the course of his athletic career, Markov made the NCAA finals as a heavyweight wrestler and threw the discus and shot put for Hec Edmundson’s track and field teams. But football was his forte. He lettered three times, made first-team All-America once and helped lead Jimmy Phelan’s teams to two bowl games (1937 Rose, 1938 Pineapple). Markov played one year of professional football (1938) and later distinguished himself in George Patton’s Army during World War II. Inducted into the College Football Hall of Fame in 1976 and the State of Washington Sports Hall of Fame in 1977 . . . First-team All-America in 1937 by the Walter Camp Foundation, Liberty Magazine, International News Service and Collier’s Magazine . . . Selected to Washington’s All-Time Team in 1950 and to UW’s All-Centennial Team in 1990. 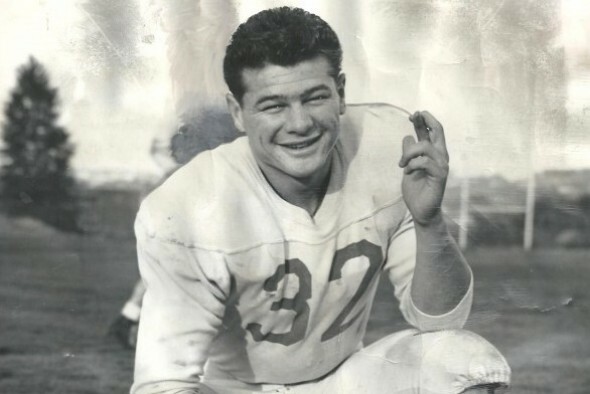 Weinmeister played tackle on offense and defense and occasionally marked time as a fullback during his Husky football career (1941-42, 1948), which was interrupted by a four-year stint in the Army during World War II. Largely as a consequence of that interruption, Weinmeister didn’t receive a lot of attention as a college player. But Ray Flaherty, head coach of the New York Yankees of the All-American Football Conference and a former player at Gonzaga and Washington State, knew of Weinmesiter and brought him to New York in 1948. For the next six years, Weinmeister was one of pro football’s greatest players, widely considered to be the first defensive lineman to captivate crowds because of his strength and speed. He became a four-time All-Pro and his six-year stint in pro football remains one of the shortest by a Hall of Famer. Inducted into the Pro Football Hall of Fame in 1984 and the State of Washington Sports Hall of Fame in 1970 . . . Named to the UW’s All-Centennial Team in 1990 . . . Joined the New York Giants in 1950 and earned All-Pro honors four times (1950-53). When the University of Washington hired Howard Odell as its head football coach in 1948, he received instructions from athletic director Harvey Cassill to turn the traditionally run-oriented Huskies into the premier passing team on the West Coast. Odell accomplished his assignment by luring Heinrich out of Bremerton High. Over the next three years, Heinrich became the first great passer in Husky football history. 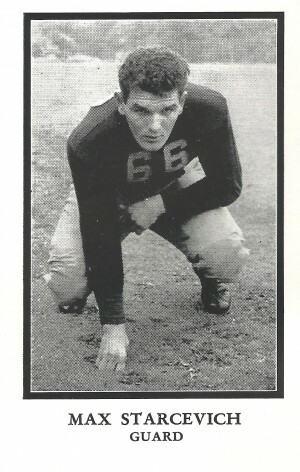 Heinrich made first-team All-America as a junior in 1950 by leading the nation in passing and, after sitting out the 1951 season with a shoulder injury, led the nation in passing again as a senior in 1952. Most of Heinrich’s school passing records didn’t fall until the Sonny Sixkiller era in the 1970s. With McElhenny, Henrich helped form one of the legendary backfields in school history. Inducted in the College Football Hall of Fame in 1987 . . . First-team AP All-America in 1950 and 1952 . . . Played in the NFL with the New York Giants and Oakland Raiders from 1954-62 . . . On Sept. 30, 1956, played against former UW teammate McElhenny for the only time in his pro career. Heinrich threw a career-high two touchdown passes covering 43 yards to Alex Webster and 35 yards to Mel Triplett in New York’s 38-21 victory at San Francisco’s Kezar Stadium. McElhenny scored two touchdowns for the 49ers on runs of 16 and 2 yards. 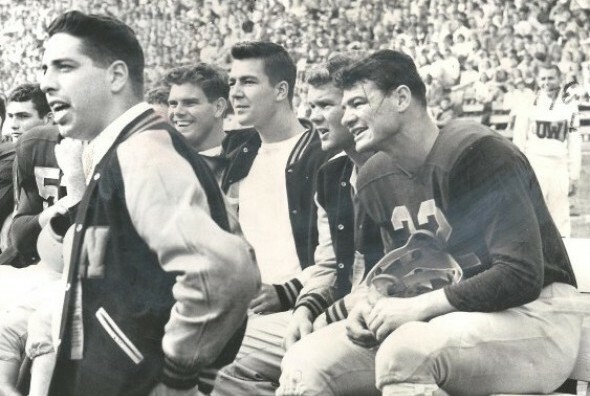 Schloredt began the 1959 Husky football season as a reserve and finished his career two years later as a two-time All-America quarterback, a two-time Rose Bowl Most Valuable Player, a Sports Illustrated cover boy (Oct. 3, 1960) and a Husky legend who would enter more than one hall of fame — several, in fact. Schloredt did all this with just one good eye. A childhood accident at the age of five left him with only five percent vision in his left orb. The handicap never seemed to bother Schloredt, who passed, ran, punted and intercepted passes during his three-year varsity career, which represented the acme of University of Washington football between the years following World War II and the arrival of head coach Don James in the mid-1970s. Inducted into the College Football Hall of Fame in 1989 and the Rose Bowl Hall of Fame in 1991 . . . Won the Voit Memorial Trophy as the top player on the Pacific Coast in 1959 . . . Associated Press All-America team after his junior year when he led the Huskies to a 44-8 rout of Wisconsin in the Rose Bowl (Huskies’ first win in Pasadena) . . . MVP in the 1961 Rose Bowl, a 17-7 UW win over Minnesota. Starcevich played only one year of high school football in Duluth, MN., where he grew up, but caught the attention of Dr. Albert Strauss, a Chicago-based University of Washington alum, who convinced Starcevich to cast his lot with the Huskies. 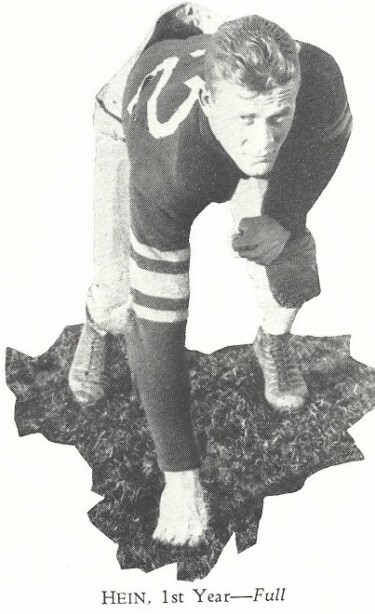 Starcevich spent a year working in a steel mill in Gary, IN., before heading west, joining the Huskies as a sophomore fullback in 1934. He switched to guard the next year, made All-Coast, and became Washington’s third consensus All-American in 1936. Starcevich helped lead the Huskies to the Rose Bowl that year, opposite the University of Pittsburgh. Inducted into the College Football Hall of Fame in 1990 . . . Named to Washington’s All-Time Team in 1950 and to the school’s All-Centennial team in 1990 . . . Consensus All-America in 1936, voted first-team status by the Associated Press, United Press International, International News Service and Collier’s magazine. Redman is one of the few Washington football players to have won All-America recognition in three different seasons (1962, 1963, 1964). He is also one of two Huskies (also Ray Frankowski) to earn consensus All-America honors in back-to-back seasons (1963-64). 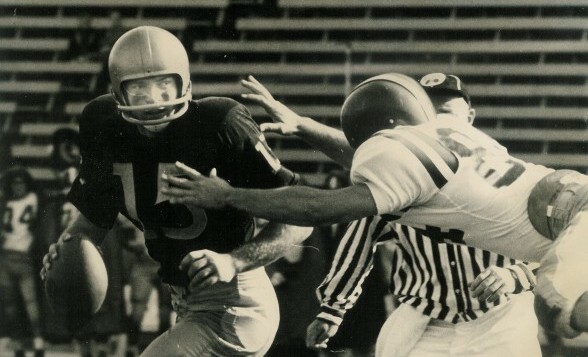 A guard and linebacker at Washington, Redman was instrumental in leading the Huskies to the 1964 Rose Bowl opposite Illinois. Following his Husky career, Redman had a nine-year run with the San Diego Chargers, retiring in 1973. First-team All-America in 1963 by United Press International, Football Writers Association, American Football Coaches, Newspaper Enterprise Association and CBS, and third-team honors by The Associated Press . . . Selected to the Pro Bowl in 1967. No quarterback in state history had a more profound impact than Moon, a 6-3, 215-pound native of Los Angeles. After he led the Washington Huskies to the 1977 Pac-8 Championship and a victory over Michigan in the 1978 Rose Bowl, the UW program vaulted to national prominence, where, under head coach Don James, it remained for nearly 20 years. After graduating, no ex-Husky quarterback had a greater pro career. Although initially spurned by the National Football League (he went undrafted and launched his pro career in the Canadian Football League), he became a perennial Pro Bowl player and first-ballot Pro Football Hall of Famer. Moon played 17 NFL seasons with the Houston Oilers (1984-93), Minnesota Vikings (1994-96), Seattle Seahawks (1997-98) and Kansas City Chiefs (1999-00), helping usher in the era of African-American quarterbacks. Inducted into the Rose Bowl Hall of Fame in 1997, the Canadian Football League Hall of Fame in 2001 and the Pro Football Hall of Fame in 2006 (only player in all three) . . 1977 co-Pac-8 Player of the Year . . . CFL’s Most Outstanding Player in 1978 and MVP of the Grey Cup in 1980 and 1982 . . . Played in nine Pro Bowls (1988-95, ’97) representing three different teams (Oilers, Vikings, Seahawks) . . . MVP of the 1998 Pro Bowl while representing the Seahawks. . . . 1988 AFC Player of the Year, 1989 AFC Player of the Year, 1990 NFL Man of the Year, 1990 NFL Offensive Player of the Year, 1990 first-team All-Pro . . . First African-American QB to: start in the Pro Bowl (1988), lead the NFL in TD passes (1990), throw for 4,000 yards in a season (1990) and 500 yards in a game (1990) . . . Oldest (40) QB to: throw for 400 yards in a game (1997), throw five TDs in a game (40 in 1997), rush or an NFL TD (age 40 in 1997) and throw a TD pass (43 in 2000) . . . First undrafted QB to earn election to Pro Football Hall of Fame (2006) and first African-American QB elected to Pro Football Hall of Fame. The most decorated player in Washington football history, Emtman is also the school’s greatest defensive player. At 6-4 and 290 pounds, and possessed of great speed and incredible strength, he literally controlled UW games in 1990-91 when he played himself into the No. 1 pick in the National Football League draft. 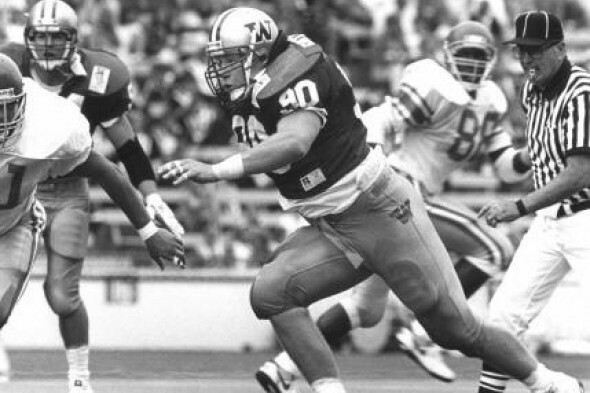 In 1991, when he led the Huskies to the co-national championship, Emtman anchored a defense that allowed only 67.1 yards rushing and 9.2 points per game. Great as he was, Emtman was a disappointment as a professional due to the numerous injuries he suffered that limited his NFC career to six seasons. Inducted into the Rose Bowl Hall of Fame in 2006, the College Football Hall of Fame in 2007 and the State of Washington Sports Hall of Fame in 2013 . . . In 1991, won the Outland Trophy and Lombardi Award, the ninth player in history to win both in the same season . . . 1991 unanimous All-America by the Associated Press . . . No. 1 overall pick in the 1992 NFL draft. Mayes came out of North Battlefield, Saskatchewan and became an All-America running back in 1984-85. As a senior, he finished 10th in Heisman Trophy voting. During his WSU career, Mayes set single-season and career rushing records (1,632; 3,519 yards) and established an NCAA record for most rushing yards in one game, 357 vs. Oregon in 1984. That record remains the Pacific-12 Conference record. Mayes held the WSU single-season rushing record from 1984 until 2005, when Jerome Harrison posted 1,900. 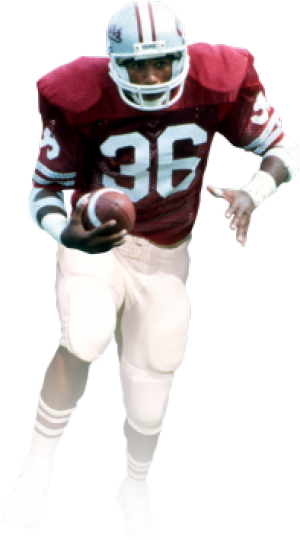 He twice blistered Washington in the Apple Cup, rushing for 167 yards in 1985 (21-20 WSU win) and 165 in 1984. Mayes went to the New Orleans Saints in the third round of the 1984 NFL draft. After five years with the Saints, Mayes played two years with the Seahawks before retiring. Inducted into the WSU Hall of Fame in 1993 and the College Football Hall of Fame in 2008 . . . 1984 consensus first-team Associated Press All-America . . . Twice named Pac-10 Offensive Player of the Year . . . Selected to WSU’s all-time team in 1995 . . . First Cougar with two 1,000-yard rushing seasons . . . NFL Rookie of the Year in 1986 after rushing for 1,353 yards . . . Earned Pro Bowl selections in 1986 and 1987. One of the most decorated offensive linemen in Washington history, Kennedy was also among the most dominant tackles in Pac-12 annals. Kennedy was a member of Washington’s 1991 co-national championship team and, during his senior season,(1992), the Huskies averaged 387.6 yards per game, largely due to his blocking. Kennedy, a San Diego, CA., native, the 6-foot-6, 345-pound Kennedy played in three Rose Bowl games as a member of the Huskies. Due to his “Presidential” name, Kennedy had the nickname “Oval Office” during his time in the NFL. For a long period in the 1990s, Kennedy severed ties with the UW program, finding fault with its lack of direction (his opinion) under athletic director Barbara Hedges. After a chance in the athletic department administration, Kennedy resumed his association with UW football.